Find out if you qualify for lower workers comp rates for your roofing company. Learn more about our Roofing Workers Comp Insurance Programs. There are almost 100,000 roofing contractors operating in the U.S., with over 285,000 employees. Many roofing companies have a hard time finding workers compensation coverage outside of their State Fund Pool because a lot of standard markets don't offer coverage for roofers. That's why we've worked with several of our best companies to create target programs for roofers. Give us a call to learn more about our programs for roofers. 5551 Roofing- All Types. This is the standard classification for most roofing contractors. It covers contractors who perform installation and repair of new and existing roofs on residential and commercial properties. Work may include flat, sloped, and builtup roofs and may include the installation or repair of joists, trusses, rafters, decks, sheathing, etc. Materials utilized may include shingles, metals, hot tar, composite materials, concrete aggregates, slate, tile, or paper. 8227 Construction Yard. Larger roofing companies who maintain a permanent facility or yard for material storage and maintenance of equipment may often utilize this classification on their policy for employees exclusively dedicated to the facility or yard. 5645 Residential Construction. When roofing installation is performed in conjunction with the construction of a residential dwelling by employees of the same general contractor then roofing may be applicable to this code. Applies only to residential construction under 3 stories. NOTES Our roofing programs require minimum payroll requirements and years in business depending on the state and the carriers' programs. Call our Specialists for specific details. Amerisafe is our "go to" carrier for roofing contractors in most states because their rates are hard to beat. UBIC is an up and coming insurance carrier with a Roofing Program as founder started as a roofing contractor. 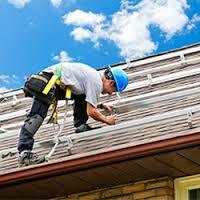 Missouri Employers Mutual offer decent rates for roofers in Missouri and the are expanding. Applied Underwriters offers a partially self-insured program for roofers with larger premiums. The California State Fund has competitive rates for roofers with good claims experience. We offer limited workmans comp quote options from some of our other insurance companies depending on your state, specific nature of roofing business, and prior claims experience. Give us a call today to learn more about our roofing programs or to see if your business qualifies. Workers compensation for roofers and roofing companies can be extremely difficult to find. But we offer a few exclusive insurance programs that may help roofing contractors save money on their next work comp insurance policy. Get start online with a roofing quote for your business, or give our Work Comp Specialists a call today at 888-611-7467 to find out more.